A lightning bolt strikes the screen, leaving the Future Shock logo. Then we see a familiar studio for the web show with a giant curved video wall behind the hosts, Zack Hudson and Gabrielle Crimson. They are sat on the now trademark purple sofa with Gary the Goldfish in a bowl decked out with rockstar decorations. Zack is adjusting Gaby’s microphone on her top before he looks to the camera to begin. Zack: Hey there, welcome to the latest After Shock. You got Zack and Gaby here today. For those unaware, Jake is on a hiatus after some recent events. But he’ll be back. Until then though, this “Wildcat” here and I will take the reins. Gaby, welcome to the purple couch! Gaby: Hey, hey! Right back at you, Zack! If there was an episode to be here for, that’s Future Shock 50. 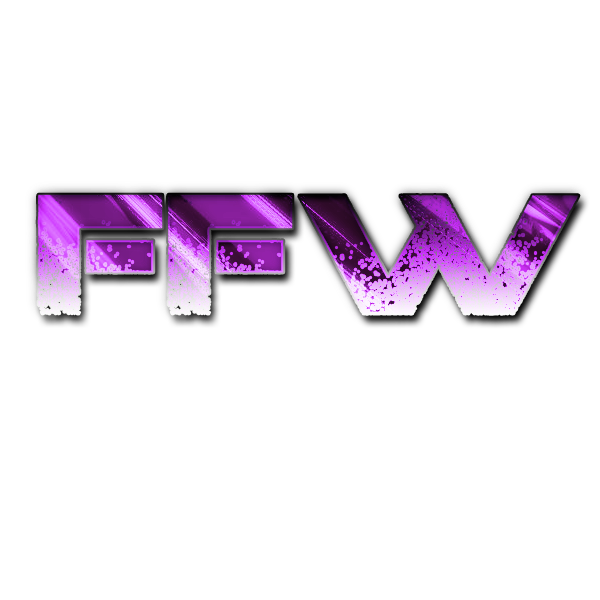 Such a landmark number deserves a special show, and that’s exactly what the FFW Faithful is getting… But we’ll get there in a moment. Zack: Absolutely, we have more than a few items to cover from the last show. And I don’t just mean the matches, which saw our Aspire Champion Lydia Charisma in a successful outing, Sydney Christensen pick up her first win, and the Gold Standard….being the Gold Standard. What stood out from the card for you, Gaby? Gaby: I could honestly go for quite a while on what I saw from the card, in and out of the ring. So let’s break the show down, starting from the top. Which means… acknowledging how the Gold Standard has become quite the threat in Future Shock. And I don’t know if anyone else has this feeling, but it all happened very suddenly. I don’t think anyone expected them to band together and be such a well oiled machine like that, but here we are. Did YOU expect that? Zack: Not this fast. You got a lot of big egos there in that group, and typically big egos don’t play well together. Gaby: Exactly! So to see Cassandra Steen and Stacey Sky steal the win under everyone’s noses like that was quite something else. The Gold Standard now holds the Future Shock Tag Championships as well, and there’s no telling where they may stop. By hook or by crook, they’ve established themselves as the power stable in the blue brand, and the last main event shows. Zack: Come Nemesis in the 5 on 5 elimination tag team main event, we may have a group who is more than capable of rivaling them and evening the odds. When you face one or two of them, you always have to keep your head on a swivel for the rest. Well they’ll all be in the ring at Nemesis, and we found out Kyle’s gonna be suspended above the ring in a shark cage for that match. Gaby: Yes, that information came through Adam Grant’s social media feed. That wasn’t said on the show, but Adam made sure to let Kilmeade know he won’t be there up close when his Fabulous Five enter the ring to face Nora Harris, former Future Shock Tag champs NHB, Bianca Reed and Harley Shannon. And this is where the “too many egos don’t blend together” factor comes into play -- I for one know I’m pretty glad that the Gold Standard doesn’t have the public support of other of Kyle Kilmeade’s clients, such as Mika Demidov. Zack: We had a special guest see the show live in the form of Skylar Rayner, who began the whole Sideboob Sunday thing on Twitter. She recently had Adam and Savannah Taylor on her talk show, so he was returning the favor. We also heard from a couple girls I know you aren’t terribly fond of, the Cortez Twins. Gabrielle rolls her eyes and groans. Gaby: I don’t believe the Cortez Twins are anyone’s cup of tea except for Christian Kincaid’s for some reason. It’s pretty confusing to me. Come Nemesis, Luna Cortez will be facing Vivienne Robichaud, in a match that the Voodoo Priestess had been waiting for for a LONG time. Tara, on the other hand, will have her own feature match at Global Wars, against Mila Martin. As for Skylar Rayner… So nice of her to feature our little corner of the industry on her show. Journalists such as herself are always welcome. Zack: Plus I know sideboob is getting more attention than ever, as a result. There’s also a return that was announced, but we’ll get to that because it’s happening on this show we’re about to discuss. That’s right, folks! The 50th edition of Future Shock since the reboot is upon us, and Adam has put together a mini-Pay Per View card….before the actual Pay Per View, Nemesis. Before we get to that though, Gaby, how do you feel about Steph Stefano’s campaign to replace Lyn Dallins on commentary? Gaby: If Lyn ever has to leave, I’d rather have her there than freaking Nicole Rossi and Mai Hotaru. What a duo, these two, huh? But, no, Lyn doesn’t have to go anywhere if he doesn’t need to. Zack: What about Dante Knox? He wants to replace me on commentary. Gaby playfully wraps her arms around Zack. Gaby: You ain’t going nowhere, sir! We need to keep Future Shock’s commentary as a paragon of professionalism and… You know, actual solid wrestling commentary. Would be nice if those biased folks would stay away instead of trying to push some of their wicked views on us. Zack: I appreciate the support. So let’s turn our attention to what’s in store for the 50th show. Two matches were already announced. The main event will be for the Future Shock Championship when Harley Shannon makes her first defense against Bianca “Killer B” Reed. Adam awarded her a rematch after her previous shot had more than a little Lacey involvement to help secure Valerie retaining. But now, there’s no Gold Standard involved so Bianca is likely to get a fair match. Gaby: Or is she? Remember, the Gold Standard doesn’t care. They’ll go after anyone if they think they have a point to make. Case in point: just last Thursday, after Bianca Reed and Rose Gardner wrestled, Lacey was there to attack them. Or… just Rose. But she was there, so there’s no telling what they may end up doing. But as for the match itself, it has all the ingredients of a blockbuster. Harley is arguably one of the most dominant Future Shock Champions there have ever been; don’t let her infant second reign as champ deceive you. And Bianca Reed is all levels of fired up for this. This could easily be a marquee match in any main roster event, but we’re giving it away for free! What a steal. Zack: Also for the first time since the reboot, we’ll have a lumberjill match. “The Lioness” Elizabeth Lannister is seemingly obsessed with proving she can beat Mila. She’ll get a third chance, but with the other four members of the Gold Standard ringside as well as Nora Harris, NHB, and….newcome Cait Flanagan who asked to be involved. I have a feeling this will turn into chaos. What about you? Gaby: First of all, as it’s custom… Let’s all have a moment of reflection for Declan Black’s money. Gaby and Zack lower their heads and stay in silence… For all of two seconds. Gaby: ANYWAY! Cait Flanagan was one of the many surprises from last show, and we held off on mentioning her because she was STOKED to be one of the lumberjills, even if she hasn’t had a match in Future Shock yet. So as it turns out, everyone has something to show for this match: Liz Lannister, who as we all know is part of the Gold Standard, and that alone spells trouble, wants to prove she can defeat Mila Martin, and I cannot stress this enough, HERSELF. Can we all see the issue here? With their big 5 versus 5 match coming up at Nemesis, and everyone except for Killer B and Harley as lumberjills because of the main event we just went over, this is going to be incredibly caustic. Zack: Kicking off the show, two of the newer Prospects get another chance to shine. The “Unbreakable” Stacy Jones is a very recent addition to the roster, but also a very outspoken one and wanting all the chances she can get. She’ll be meeting Katie Keller, or Double K as I think of her. Katie’s picked up her first in Future Shock, but has had trouble repeating it. This one’s a pick’em between two veterans. Gaby: And, in my opinion, a great chance for them to show the FFW Faithful why they should be the next big thing from Future Shock going forward. This match is one of those moment where you realize that how we’re lucky to have such an environment here in FFW that even seasoned vets and icons of the game such as these two are willing to go through the hoops to make a number! Katie has made herself known to the Faithful for a little longer than Stacy Jones has, but this could easily be a hard hitting contest with the fans split right down the middle. Zack: Also promised is the return of another Prospect who has been out of action for weeks with an injury. Well she’s rehabbed, and ready to come back. I’m referring to Celeste. Zack: I don’t know what she has in mind for the show, just that she’ll be with us back in Boston for the 50th episode. Another of CK’s clients, Celeste came within an eyelash in her last match of capturing the Aspire Ring...as it was. You could assume that maybe she’s still got her eyes on the title. Gaby: And now that the ring is a full fledged title, I bet that’s going to make her -- and anyone else with their eyes on the prize honestly -- even hungrier for it. Welcome back, Celeste; you’ve certainly been missed. Go get’m! Zack: It’s rare you have two major events coming back to back like we do in Future Shock. This 50th episode will be the final stop before the Prospects head for MSG on November 20th for Future Shock Nemesis. That’s just what we know is going to happen, there’s no telling what else. I hope we are able to get to the bottom of what happened to Little Pixie Pump during the main event. That investigation is still ongoing, I understand. So all that and a big card including a rare TV defense of the Future Shock Championship in the main event makes the 50th episode a “can’t miss” show. Gaby, what are you most looking forward to seeing? Gaby: The Future Shock Championship being defended, of course! But, and I know this may sound like a cop out, but this entire show is a must-see. Not only because of the milestone that is the 50th episode since the reboot, but also because most of the names involved in Nemesis will be there: everyone involved in the 5 versus 5 at Nemesis will be in the Lumberjill Match, except for Bianca and Harley who will be in the main event. We will also have the final words from all other superstars leading into the final Future Shock PPV of the year… which, yes, means we get to hear from the Cortez Twins again… But we also get to meet everyone who will head on to the temple of sports in New York before Nemesis rolls on. Zack: Make sure you’re part of it all. 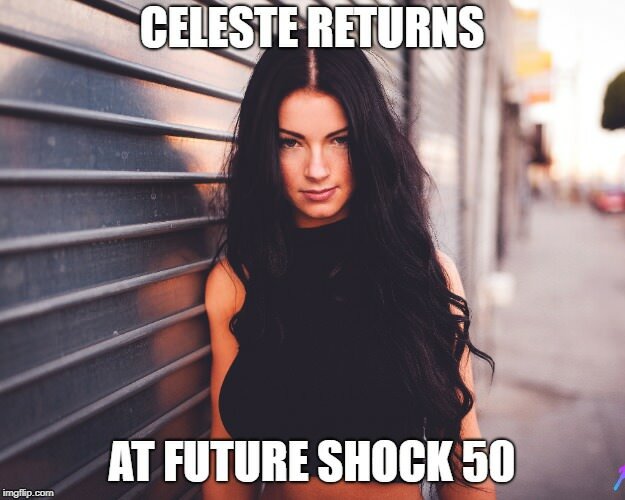 Future Shock is back home in Boston yet again on November 6th. Gaby and I will certainly b4e there to see what transpires in the final days leading to Nemesis. Thank you for watching After Shock, and we’ll see you on the 6th for the landmark 50th episode of Future Shock. The pair resume chatting before the scene fades out.